Shaila Prabhakar concentrates her practice in the areas of securities regulation, public offerings, private placements, state blue-sky compliance, corporate formations and reorganizations, mergers and acquisitions, and shareholder and employee agreements. In addition, her practice also includes estate planning and administration. Prior to joining Lurio & Associates, P.C., Ms. Prabhakar practiced with Dechert, LLP, where she was an associate in the Corporate and Securities practice group of the Business Department. She is admitted to practice law in the Commonwealth of Pennsylvania and the State of New Jersey. Ms. Prabhakar’s prior experience also includes two years as an associate in the law firm of Dua Associates in Bangalore and New Delhi, India, and an externship with the Honorable Jerome B. Simandle of the Federal District Court in Camden, New Jersey. 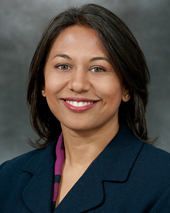 Ms. Prabhakar is a member of the Philadelphia Bar Association and a former Vice President and member of the Board of the South Asian Bar Association of Philadelphia. She speaks Kannada fluently and is conversant in Hindi.